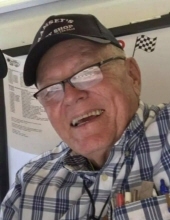 DURHAM – John “Alf” Wall, 77, passed away Monday, October 22, 2018 at Duke University Hospital. Born in Wake County, Mr. Wall was the son of the late John Ashton Wall and Johnnie Pearl Watson Wall. Mr. Wall was formerly employed as a science technician at the Environmental Protection Agency. He was known as the “Carburetor Man” to many. Mr. Wall is survived by his wife, Linda Weaver Wall; and a son, Dusty Wall. A funeral service will be conducted 11 a.m. on Thursday, October 25th at Mt. Moriah Baptist Church with Rev. Jimmy Bland and Rev. Bob Weatherly officiating. Interment will be in the Mt. Moriah Baptist Church Cemetery. The family will receive friends Wednesday, October 24th from 6 to 8 p.m. at Clements Funeral Home, Durham. In lieu of flowers, memorial contributions may be made to Mt. Moriah Baptist Church, 549 Erwin Rd., Durham, NC 27707. To send flowers or a remembrance gift to the family of John "Alf" Wall, please visit our Tribute Store. "Email Address" would like to share the life celebration of John "Alf" Wall. Click on the "link" to go to share a favorite memory or leave a condolence message for the family.